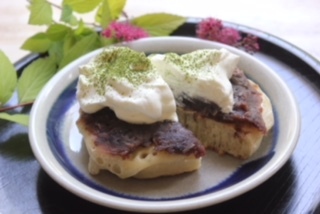 Today’s oyatsu (snack) is an anko crumpet! 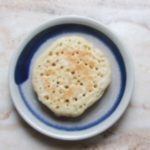 A crumpet is a small griddle cake originated in England. The outside is crispy and crunchy and the inside is soft and chewy. The flat top has pores–perfect for butter to permeate. Scrumptious Crumpet in southeast Portland makes great crumpets! 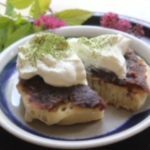 We put butter (lots of), anko (redbean paste), whipped cream and sprinkled some matcha on top.